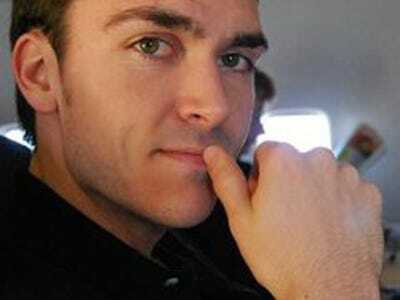 David Byttow, the former founder and CEO of notorious Silicon Valley flop Secret, has a new company brewing, called Bold — and this time, he thinks he can crack the notoriously difficult business market. Secret, an app that let you anonymously share your thoughts with the world, started off strong when it launched in 2014. But Secret quickly became better known for its founders’ lavish spending habits and its reputation as a gathering place for cyber-bullies than as an open communications tool. After gaining 15 million users, raising $35 million in venture funding, and drastically changing the product a few times, Byttow made the decision to shut down the year-old Secret. Most of the money was returned to investors, but Byttow and Chrys Bader-Wechseler had taken $3 million of the venture investment off the table for their personal coffers, and it’s not clear if they ever gave this money back. Now, as TechCrunch reports, Byttow’s four-person Bold team has raised $1 million in funding from Index Ventures. Bold is a product for letting people inside of companies write long-form content — blog entries, memos, product manuals, that kind of thing. A lot of that is already handled by products like Microsoft Sharepoint and Google Docs, so it will be an uphill battle. “Everyone has opinions, yet they often go unshared — we want to solve that problem,” Byttow writes in a blog post. Byttow explains that Bold has an edge: Hemmingway, a bot that automatically makes suggestions on how to write better as you type. He says that in the future, Bold will support additional bots from outside developers. With bots a super-hot commodity in Silicon Valley these days, that may explain the investor interest. Play GIFBoldBold’s Hemmingway bot suggests how to write better. Cracking the enterprise market is a risky bet for any company: Businesses have stringent, exacting requirements for their software and app needs, are often slow to adopt new technologies, and demand high levels of support. Plus, there’s an old enterprise tech industry saying: “Nobody ever got fired for buying IBM.” Which is to say, the momentum of established software is real and powerful. Even the best, brightest, most-well-funded startups have a lot of trouble making the transition to a business software focus. For instance, $2 billion startup GitHub, the “Facebook for programmers,” recently walked back its enterprise ambitions after finding that it couldn’t line up its massive consumer success with the needs of the big business. 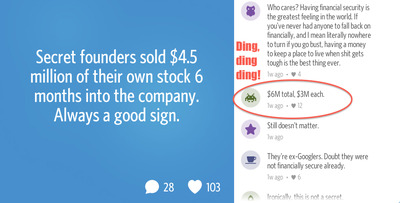 Secret tried adding an enterprise feature called “Dens” for internal anonymous sharing before it went kaput. 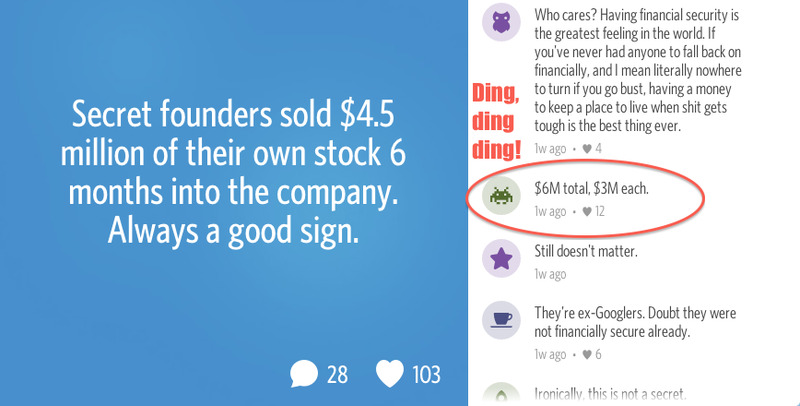 Secret/Business InsiderThis post on Secret itself revealed how the two founders each took $3 million of the company’s venture funding off the table. There are exceptions, notably the $2.8 billion startup Slack. Slack CEO Stewart Butterfield’s past experience had been in consumer web services (he sold Flickr to Yahoo for $35 million in 2005) and in video games (Slack started as an internal support tool for Glitch, an online multiplayer game). Yet Slack reportedly does annual revenue of $64 million, and it’s growing fast. So, it’s possible for a founder with a consumer technology focus to shift gears and sell to the enterprise. But Secret’s very public rise and fall doesn’t instill a lot of confidence. Bold wasn’t immediately available for comment.